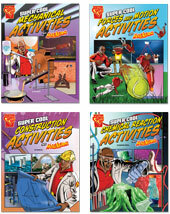 Inspire future scientists and engineers with dozens of amazing experiments and activities. Super Scientist Max Axiom hosts a collection of kid-friendly projects related to chemical reactions, forces and motion, mechanical engineering, and structural engineering. 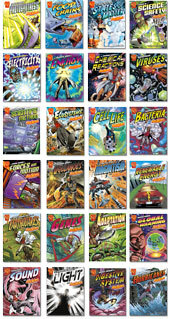 Super Scientist Max Axiom is back in action with these nonfiction graphic novels. 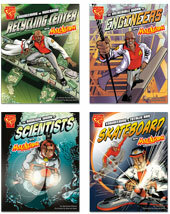 Max uses his super powers to demonstrate and explore science, technology, engineering, and math (STEM) concepts in ways never before experienced in the classroom. 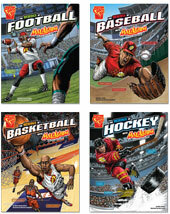 Join Super Scientist Max Axiom as he reveals the science behind a perfectly placed pass, a home run hit, and a well-timed dunkall in graphic novel format. A creative way to use zombies, werewolves, and vampires to teach science. 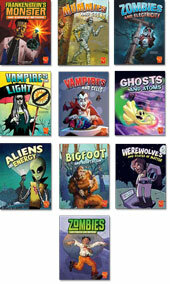 Each book uses a monster to present important scientific facts in an engaging and hilarious comic-book format. Max Axiom is the ultimate science teacher. Watch him demonstrate and explain scientific concepts in a cool way.